We spoke with Funches about his comedy, and finding confidence in strange places, and joking about things that matter to you. ❷ Before turning to comedy full-time, Funches worked a range of jobs. “I’ve worked as grocery store cashier, I’ve worked at a bank call center, and as a Lady Liberty for Liberty Tax Service dancing around with the sign for a while,” he says. The latter taught him quite a bit about himself as a performer. ❹ Funches’ style of performance is completely his own. 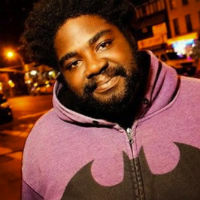 Where many other comedians create stage personas that are boisterous, obnoxious, and loud, Funches prefers comedians “who can control a crowd while still being quiet.” Much like himself.